The Christ in majesty standing above the altar recapitulates the offering of the whole world and all of humanity in the sacrifice of the cross. At the foot of Christ crucified stand the martyrs of Uganda: they are the image of all those people in Africa who have united the sacrifice of their lives to that of Christ crucified. The cross rises up out of a cosmic background of cruciform patterns (the four points of the compass), of sun and moon motifs (circles and crescents) and triangular and diamond shapes, symbols of fertility and life. The whole is in three fundamental colours: red the colour of life, black the colour of suffering, and white the colour of death. 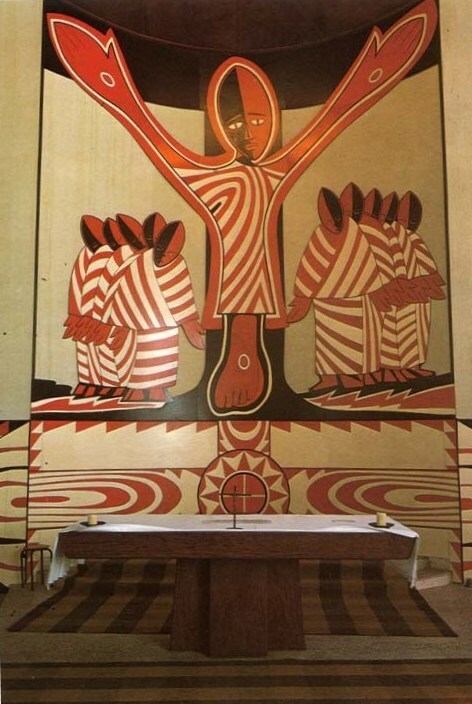 Engelbert Mveng: Ugandan Martyrs Altar, Libermann College, Douala, Cameroon. 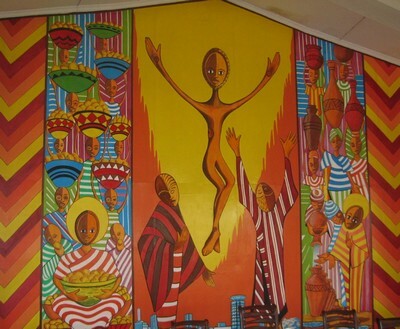 Engelbert Mveng: Resurrection, Hekima College, Nairobi, Kenya, 1962. Published inHans-Ruedi Weber: On a Friday Noon. Meditations under the Cross, World Council of Churches – Geneva, 1979. Taken over with permission by the publisher.